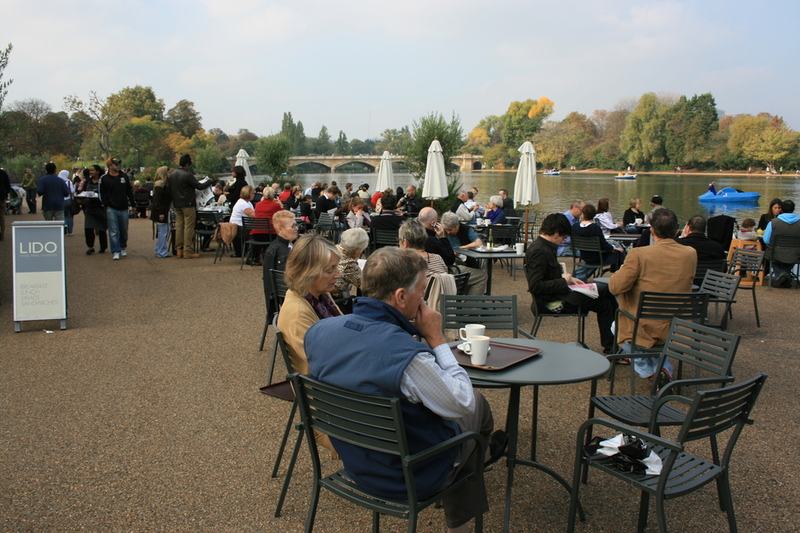 On the south side of the Serpentine, near the Diana Princess of Wales Memorial Fountain, The Lido Cafe Bar is entirely civilised and, as the restaurant is licensed for alcohol, you can enjoy a glass of white wine with your salmon salad while overlooking Hyde Park. Considering this is a prime spot with plenty of outdoor tables over looking the lake, it's very reasonably priced too. In the summer the cafe also runs a Swimming Kiosk next to the children's paddling pool above the cafe serving sandwiches and snacks as well as hot and cold drinks. It is open from 10am to 6pm on weekends in May (including May Day Bank Holiday) and seven days a week from the beginning of June to the middle of September. The Lido Cafe Bar gyms, sporting activities, health & beauty and fitness. The best pubs near London The Lido Cafe Bar. The Lido Cafe Bar clubs, bars, cabaret nights, casinos and interesting nightlife. Where to have your meeting, conference, exhibition, private dining or training course near The Lido Cafe Bar. From cheap budget places to stay to luxury 5 star hotels see our special offers for The Lido Cafe Bar hotels, including Amba Hotel Marble Arch from 79% off.